The Shasta Knights might be able to take down a few dragons, but when it comes to a pack of fierce Lady Cougars, the Knights never stood a chance. The Lassen College women’s basketball team hosted Shasta College to the first game of the Golden Valley Conference on Saturday, Jan. 6. Much to Shasta’s surprise, the Lady Cougars not only put up a strong fight, but they also didn’t hesitate to take the win 70-65. The Knights had initially opened the game with two good free throws to put them on the board and effectively anger their hosts. With 9:11 remaining of the first quarter, Shayla Carrier was first to hit a layup. Less than one minute later, Hannah Carson hit a good rebound shot before stealing the ball moments later and delivering another good shot to put the Lady Cougars on top of a 6-2 lead. Shasta hit a good rebound to bring their point tally up to four, but Maddie Camacho was quick to counter with her first basket of the day at 7:11. Brynn Winters kept the Cougar fans hooting and hollering as the quarter started minute four with a strong block that kept the Knights at bay. Soon afterward, Shasta was able to manage a basket, but at 6:24, Winters returned to the spotlight to hit a good field goal from the top of the key. With six minutes remaining of the quarter, Carson shot another basket with an assist from Camacho. Shasta followed with a good free throw soon afterward, but Lassen merely laughed at the effort. With 5:41 remaining, Victoria Moore hit the first three-pointer of the game. Carson followed with a rebound shot and Gracie McCoy finished off the Lassen run with a layup. Shasta hit another two free throws by the time the clock hit two minutes, but a good Cougar basket from Unique Smith negated the Shasta success. The Knights hit another free throw with 1:51 on the clock, but Smith was quick to follow with a three-pointer to keep the Cougar fans cheering. Shasta gained another four points via free throws and a basket as the clock entered its final minute. Then, a hook shot from McCoy brought the Grizzlies to 26 points, where they remained for the last 40 seconds of the game. Cougars were still clearly on top as the buzzer rang with a 26-17 Lassen score lighting up the gymnasium. 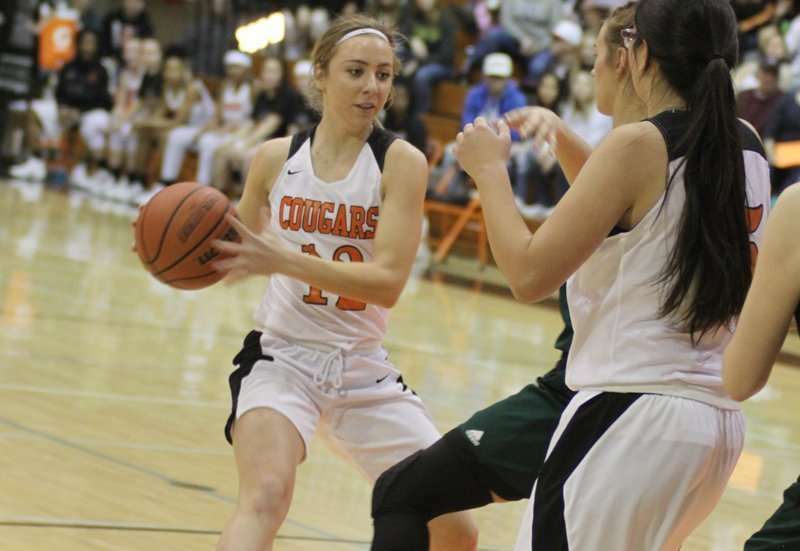 In quarter two, the Cougars continued to keep their focus and ended up with a 19-point gain to counter Shasta’s 14. Carrier was first to score in the quarter with a rebound shot at 9:01, but Carson quickly followed with a layup to give the Cougars a healthy dose of backup. At 7:14, Jocelyn Gandara hit a good layup and followed with a good free throw to bring Lassen up to 33 points. After Gandara’s performance, the Lady Knights woke up on the court and finally managed a three-pointer to bring their tally to 20 points. With less than six minutes remaining of the half, Camacho scored a basket. Thanks to McCoy catching the defensive rebound, Gandara kept the Lassen rhythm running smoothly with a basket not long after Camacho’s success. Another two good free throws by Shasta were followed with a three-pointer and a two-point field goal. However, with 1:17 on the clock, Camacho kept the fans cheering for the orange and black with a three-pointer. A defensive rebound caught by Winters resulted in a three-pointer by Gandara, and after another two free throws by the Knights, Gandara landed another basket to end the quarter with 45 Cougar points. Shasta finished the half with a layup in the final second to bring their score to 31 points. In the second half, Gandara started with a basket, but was soon followed by a Shasta basket. 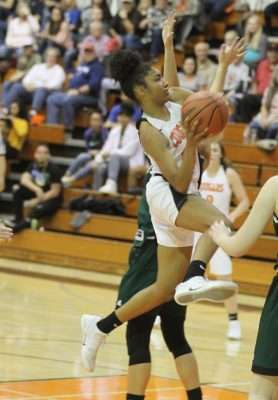 She then hit a three-pointer, and after a three-pointer shot by Camacho, a Shasta Knight eager to mirror Gandara’s success again stepped up to the line. With 5:42 on the clock, Shasta hit a three-pointer. 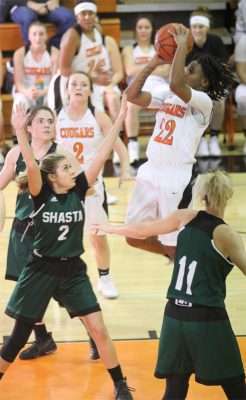 Shasta appeared to finally gain some momentum after their three-pointer as they gained six points in the span of 60 seconds. Lassen regained the ball and sent in Carrier for a layup at 3:14, but Shasta was quick to recover with a set of good free throws to bring their score to 44 points. 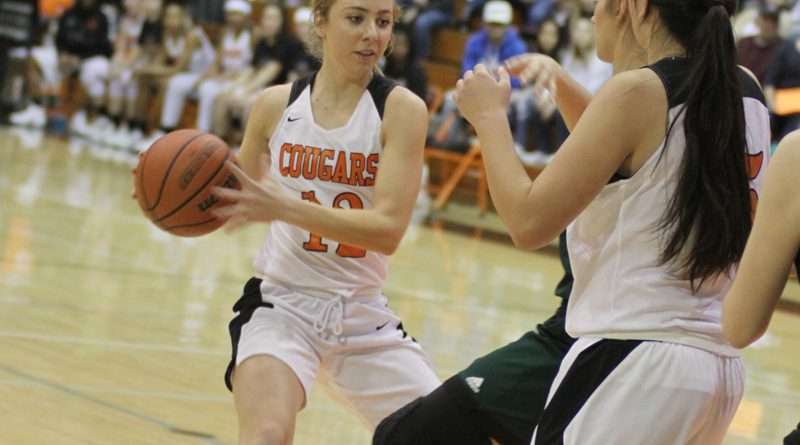 Luckily, Lassen’s established lead was enough to handle Shasta’s sudden jump in enthusiasm, so after a hook shot from Smith, the Lady Cougars were still sitting pretty on a 57-44 lead. Shasta hadn’t thrown in the towel for the quarter just yet, though, as the Knights managed another free throw and another two-point field goal to bring the score to 57-47, Lassen, by the quarter’s end. Smith stepped up her game in the final quarter with a good free throw at 9:32 and a three-pointer to follow nine seconds later. Shasta countered with two baskets in a two-minute span and though Smith was quick to score another basket at 7:26, the Knights were eager to fight back with a three-pointer a few moments later. A good free throw from Carson brought the score to 64-54, but a few baskets brought the Knights within a four-point reach of the Cougars by 5:22. Carrier hit a rebound with 5:05 remaining and a layup by Gandara seemed to reassure Cougar fans for a minute, but a Shasta three-pointer reintroduced chaos to the court. Shasta hit another basket at 1:25 and stared at the 68-65 score with hope. However, as is the nature with any Cougar, the Lassen ladies finished off their prey with two good free throws and solidified the win with less than 15 seconds on the clock. The 70-65 score caused the stands to erupt with cheers and certainly provided a great start to the conference.